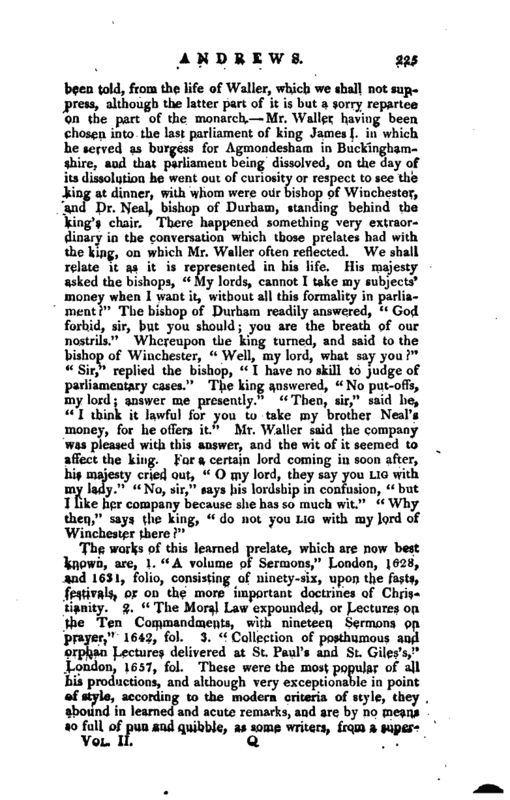 See an answer to a letter written at Oxford, and superscribed to Dr. Samuel Turner, concerning the church and the revenues thereof, 4to pamphlet, page 33. Granger, volume I, page 347. Not many years ago, his bones were dispersed, to make room for some corpse and the hair of his beard, and his silken cap, were found undecayed in the remains of his coffin. The character of bishop Andrews, both in public and private life, was in every respect great and singular. His contemporaries and biographers celebrate, in particular, | his ardent zeal and piety, demonstrated not only in his private and secret devotions between God and himself, in which those, who attended him, perceived, that he daily spent many hours; but likewise in his public prayers with his family in his chapel, wherein he behaved so humbly, devoutlv, and reverently, that it could not but excite others to follow his example. His charity was remarkable even before he came to great preferments; for, while he continued in a private station of life, he relieved his poor parishioners, and assisted the prisoners, besides his constant Sunday alms at his parish of St. Giles, Cdpplegate. But when his fortune increased, his charity increased in proportion, and he released many prisoners of all sorts, who were detained either for small debts or the keeper’s fees. 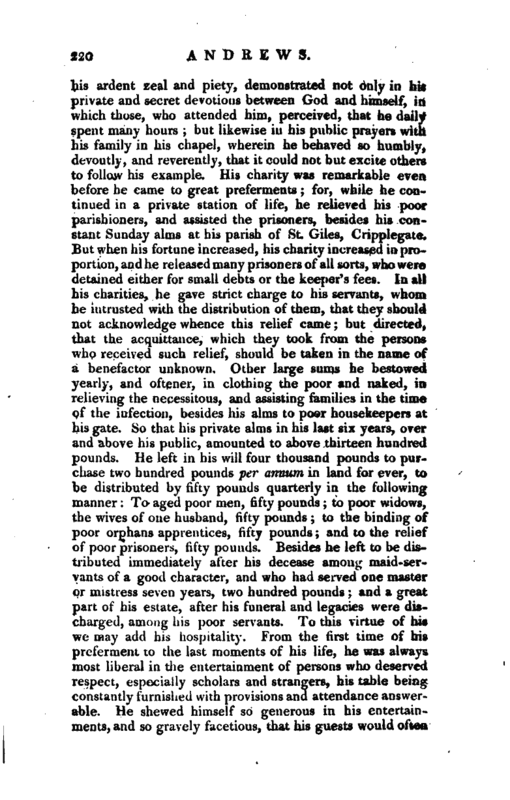 In all his charities, he gave strict charge to his servants, whom he intrusted with the distribution of them, that they should not acknowledge whence this relief came; but directed, that the acquittance, which they took from the persons who received such relief, should be taken in the name of a benefactor unknown. Other large sums he bestowed yearly, and oftener, in clothing the poor and naked, in relieving the necessitous, and assisting families in the time of the infection, besides his alms to poor housekeepers at his gate. So that his private alms in his last six years, over and above his public, amounted to above thirteen hundred pounds. He left in his will four thousand pounds to purchase two hundred pounds per annum in land for ever, to be distributed by fifjy pounds quarterly in the following manner: To aged poor men, fifty pounds; to poor widows, the wives of one husband, fifty pounds; to the binding of poor orphans apprentices, fifty pounds; and to the relief of poor prisoners, fifty pounds. Besides he left to be distributed immediately alter his decease among maid-servants of a good character, and who had served one master or mistress seven years, two hundred pounds; and a great part of his estate, after his funeral and legacies were discharged, among his poor servants. To this virtue of his we may add his hospitality. From the first time of his preferment to the last moments of his life, he was always most liberal in the. entertainment of persons who deserved respect, especially scholars and strangers, his table being constantly furnished with provisions and attendance answerable. He shewed himself so generous in his entertainments, and so gravely facetious, that his guests would often | profess, that they never came to any man’s table, where they received more satisfaction in all respects. 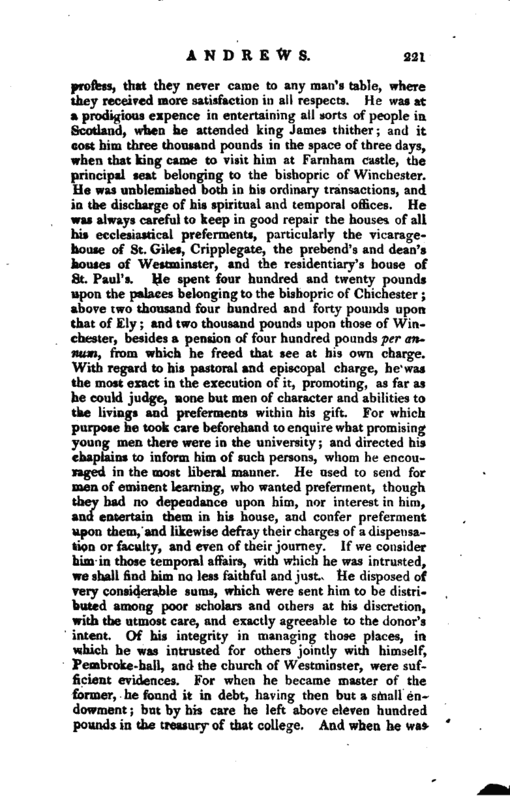 He was at a prodigious expence in entertaining all sorts of people in Scotland, when he attended king James thither; and it cost him three thousand pounds in the space of three days, when that king came to visit him at Farnham castle, the principal seat belonging to the bishopric of Winchester. He was unblemished both in his ordinary transactions, and in the discharge of his spiritual and temporal offices. He was always careful to keep in good repair the houses of all his ecclesiastical preferments, particularly the vicaragehouse of St. Giles, Cripplegate, the prebend’s and dean’s houses of Westminster, and the residentiary' s house of St. Paul’s. He spent four hundred and twenty pounds upon the palaces belonging to the bishopric of Chichester; above two thousand four hundred and forty pounds upon that of Ely; and two thousand pounds upon those of Winchester, besides a pension of four hundred pounds per annum from which he freed that see at his own charge. With regard to his pastoral and episcopal charge, he was the most exact in the execution of it, promoting, as far as he could judge, none but men of character and abilities to the livings and preferments within his gift. For which purpose he took care beforehand to enquire what promising young men there were in the university; and directed his chaplains to inform him of such persons, whom he encouraged in the most liberal manner. He used to send for men of eminent learning, who wanted preferment, though they had no dependance upon him, nor interest in him, and entertain them in his house, and confer preferment upon them, and likewise defray their charges of a dispensation or faculty, and even of their journey. If we consider him in those temporal affairs, with which he was intrusted, we shall find him no less faithful and just. He disposed of very considerable sums, which were sent him to be distributed among poor scholars and others at his discretion, with the utmost care, and exactly agreeable to the donor’s intent. Of his integrity in managing those places, in, which he was intrusted for others jointly with himself, Pembroke-hall, and the church of Westminster, were sufficient evidences. For when he became master of the former, he found it in debt, having then but a small endowment; but by his care he left above eleven hundred pounds in the treasury of that college. And when h | dean of the latter, he left it free from all debts and encroachments; and took such care of the school, that the scholars were much improved not only by his direction and superintendance, but even by his personal labours among them. And as by virtue of his deanery of Westminster, his mastership of Pembroke-hall, and his bishopric of Ely, the election of scholars into Westminster-school, and from thence into the two universities, and of many scholars and fellows into Pembroke-hall, some in Peter-house, and some in Jesus college, were in his power and disposal, he was always so just, that he waved all letters from great personages for insufficient scholars, and divested himself of all partiality, and chose only such as he thought had most merit. 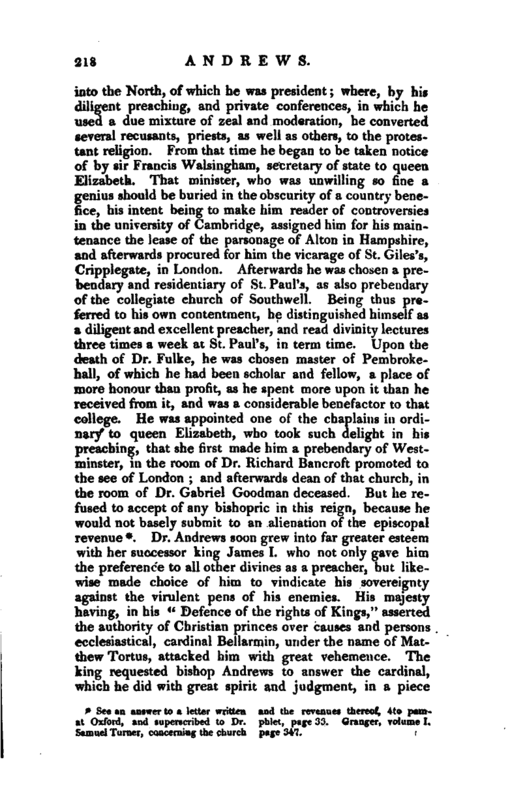 Being likewise often desired to assist at the election of scholars from the Free -schools of Merchant Taylors, St. Paul’s, and the Mercer’s, and perceiving favour and interest sometimes overbalancing merit with those to whom the choice belonged, and that divers good scholars were omitted, and others preferred, he frequently took care of such as were neglected, and sent them to the university, where he bestowed preferment upon them. Nor was he less distinguished for his fidelity in that great place of trust, the almonership. He never would suffer any part of what arose to him from that place to be mingled with his own rents or revenues, and was extremely exact in disposing of it. When he found a surplus over and above the ordinary charges, he distributed it in the relief of the indigent and distressed; though it was in his power to have applied this to his own use (his patent being sine compute), and no person could have questioned him concerning it. He gave a great many noble instances of his gratitude to those who had befriended him when young. 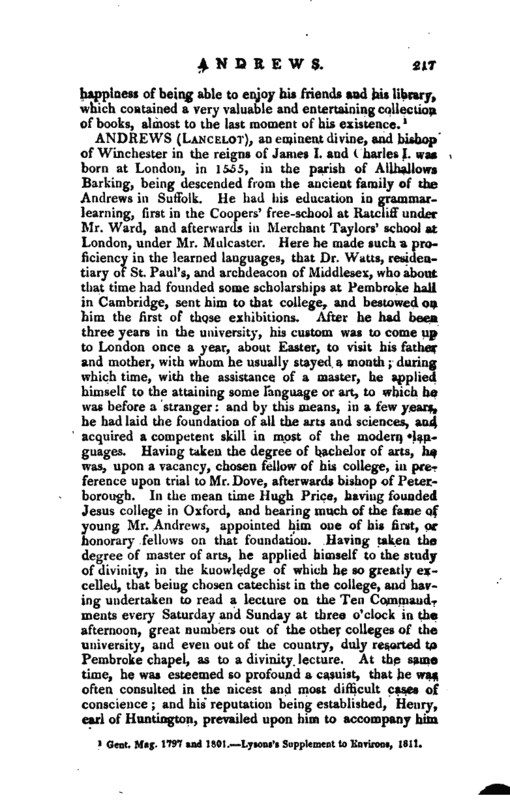 He bestowed upon Dr. Ward, son to his first schoolmaster, the living of Waltham in Hampshire. He shewed the greatest regard for Mr. Mulcaster, his other school-master, in all companies, and always placed him at the upper end of his table, and after his death caused his picture (though he had but few others in his house) to be set over his study door. Besides these external marks of gratitude he supplied his necessities privately in a very liberal manner, and left his son a valuable legacy. 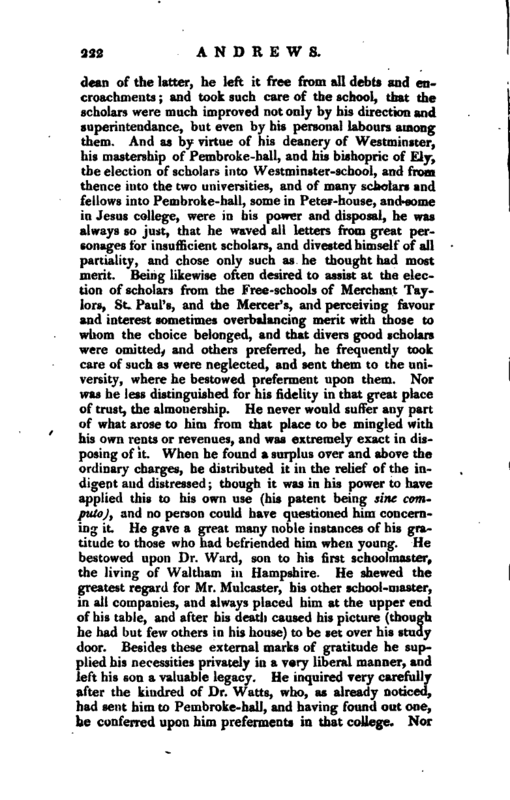 He inquired very carefully after the kindred of Dr. Watts, who, as already noticed, had sent him to Pembroke-hall, and having found out one, he conferred upon him preferments in that college. Nor | did he forget his patron Dr. Watts in his will; for he ordered there, that out of the scholarships of his foundation, the two fellowships, which himself had founded in that college, should be supplied, if the candidates should be fit for them. To omit the legacies which he left to the parish of St. Giles, Cripplegate, St. Martin, Ludgate, where he had lived, St. Andrew’s, Holborn, St. Saviour’s, Southwark, Allhallows, Barking, where he was born, and others; he gave to Pembroke-hall one thousand pounds to purchase lands for two fellowships, and for other uses in that college, expressed in his will; besides three hundred such folio books of his own as were not in the library there, with several other valuable gifts. 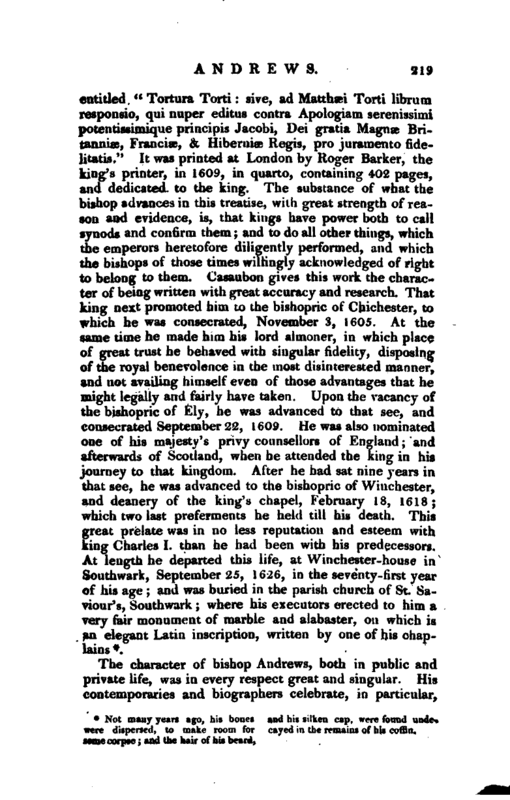 His humanity extended to every person who conversed with him; so that he was admired not only by the men of learning and others in this kingdom, but even by foreigners of the greatest eminence, particularly Casaubon, Cluverius, Vossius, who corresponded with him by letters, Grotius, Peter du Moulin, Barclay, the author of the Argenis, and Erpenius, to whom he offered an annual stipend to read lectures at Cambridge in the oriental tongues, the professors of which he encouraged very liberally, and particularly Mr. Bedvvell, to whom he gave the vicarage of Tottenham in Middlesex. 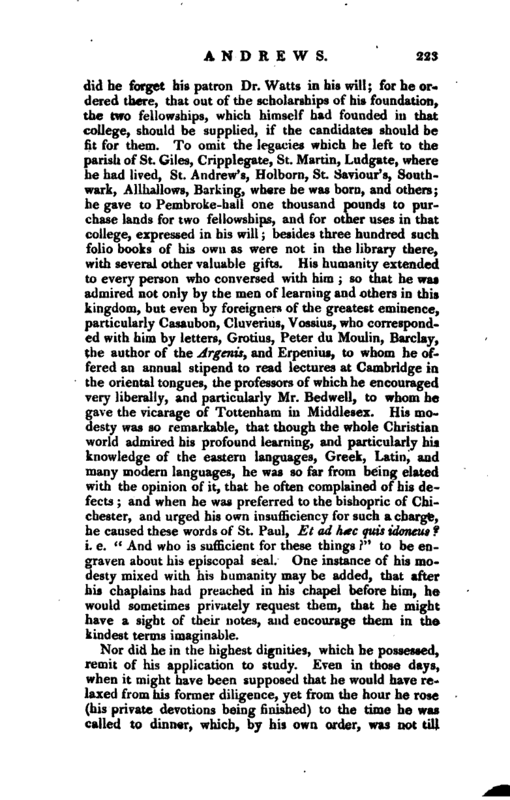 His modesty was so remarkable, that though the whole Christian world admired his profound learning, and particularly his knowledge of the eastern languages, Greek, Latin, and many modern languages, he was so far from being elated with the opinion of it, that he often complained of his defects; and when he was preferred to the bishopric of Chichester, and urged his own insufficiency for such a charge, he caused these words of St. Paul, Et ad hac quis idoneus? i. e. “And who is sufficient for these things?” to be engraven about his episcopal seal. One instance of his modesty mixed with his humanity may be added, that after his chaplains had preached in his chapel before him, he would sometimes privately request them, that he might have a sight of their notes, and encourage them in the kindest terms imaginable. Nor did he in the highest dignities, which he possessed, remit of his application to study. Even in those days, when it might have been supposed that he would have relaxed from his former diligence, yet from the hour he rose, (his private devotions being finished) to the time he was called to dinner, which, by his own order, was not till | twelve at noon at the soonest, he continued at his studies, and would not be interrupted by any who came to speak to him, or upon any occasion, public pray or excepted So that he would be displeased with scholars, who attempted to speak with him in the morning, and said, that he doubted they were no true scholars who came to speak with him before noon. After dinner for two or three hours space he would willingly pass the time, either in discourse with his guests or other friends, or in dispatch of his own temporal affairs, or of those who by reason of his episcopal jurisdiction attended him. Having discharged which, he returned to his study, where he spent the rest of the afternoon, till bed-time, except some friend engaged him to supper, and then he ate but sparingly. He had a particular aversion to all public vices, but especially to usury, simony, and sacrilege. He was so far from the first, that when his friends had occasion for such a sum of money as he could assist them with, he lent it to them freely, without expecting any thing in return but the principal. Simony was so detestable to him, that by refusing to admit several persons, whom he suspected to be simoniacally preferred, he suffered much by law-suits, choosing rather to be compelled to admit them by law, than voluntarily to do that which his conscience made a scruple of. With regard to the livings and other preferments which fell in his own gifts, he always bestowed them freely, as we observed above, upon men of merit, without any solicitation. It was no small compliment that king James had so great an awe and veneration for him, as in his presence to refrain from that mirth and levity in which he indulged himself at other times. 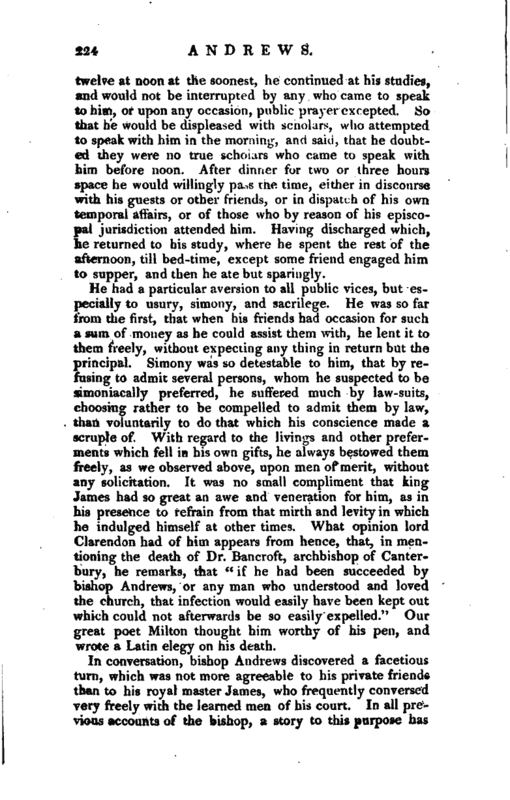 What opinion lord Clarendon had of him appears from hence, that, in mentioning the death of Dr. Bancroft, archbishop of Canterbury, he remarks, that “if he hatl been succeeded by bishop Andrews, or any man who understood and loved the church, that infection would easily have been kept out which could not afterwards be so easily expelled.” Our great poet Milton thought him worthy of his pen, and wrote a Latin elegy, on his death. Biog. Brit, and Addenda, vol. II. Fuller’s Abel Redivivus. Lloyd and Wimstanley’s Worthies. Fuller’s Worthies. —Strype’s Whitgift, p. 597, 475, 501. Harrington’s Brief View. Birch’s Tillotson, p. 19, 20. 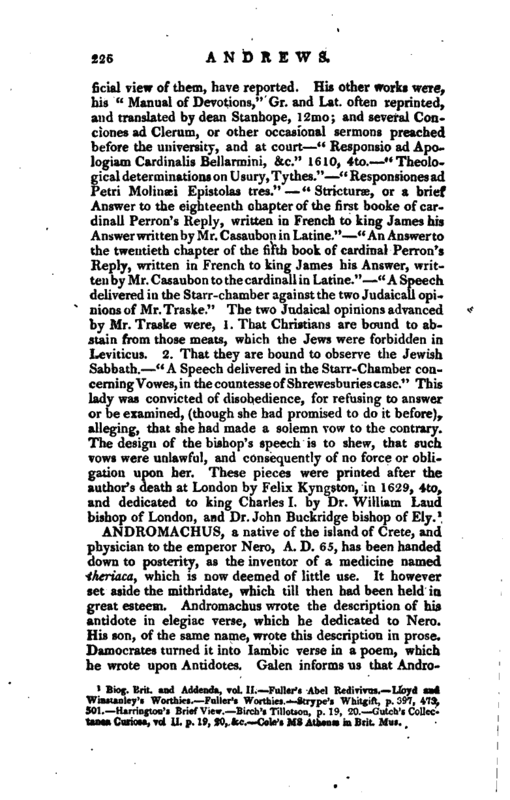 G inch’s Collectanea Curiosa, vol II. p. 19, 20, &c. Cole’s ms Athenae in Brit Mus.